Every monsoon, the Gond and Korku tribes of Madhya Pradesh’s Betul and Harda districts celebrate Hari Jiroti. It is a month-long festival of greenery, during which the tribals plant saplings of fruit-bearing trees. “We plant the trees for our children in the memory of our elders who planted for us,” says Fundia Bai Parte of Korku village in Betul. 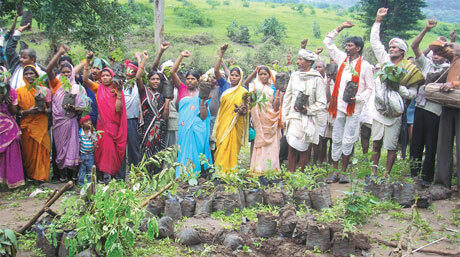 This year too, on August 13, about 200 people from five villages in Betul gathered in an open tract of forestland, which serves their nistaar (forest produce meant for direct consumption of people) needs, to plant 2,500 saplings of fruit varieties, including wild mango, jamun, bael, jackfruit and custard apple, and mahua. But the mood at the event was sombre, unlike the tone of the song the tribals were singing while planting: “Hariyali khushhali layenge, ped paudha lagayenge (we will bring back greenery and well being; we will plant trees and plants)”. “For the past decade, we have been planting trees on this same plot,” explains Fundia Bai, “but every year the forest department destroys them. Till date, at least 50,000 saplings have been destroyed.” Why is the department hostile towards such an endeavour? “The officials say we cannot practice horticulture on forestland. They call us encroachers and file false cases against us,” says Fundia Bai. Some people in Bod, Pipalbarra and Dhumka villages in Betul have five court cases against them. “Trees that give food and provide income are growing rarer in the forest as the department keeps planting teak,” she adds. The department prefers teak because it earns revenue from its sale. But Betul’s divisional forest officer (DFO) P S Champawat says the residents are using plantation as a facade to encroach on forestland. The disappearance of fruit species from the once-rich forests of Betul and Harda started during the colonial times when trees were felled on a large scale and replaced with teak. This was done to meet the need for sleepers for British government’s railway network. Felling was stopped in 1983, but teak monoculture is still being propagated. Traders, meanwhile, pressured the tribals to extract forest produce for a pittance. “We would harvest amla and jamun while they were still half-ripe,” recalls Munnalal Uike of Bod. “Sometimes traders would force us to fell trees so that fruits could be plucked faster,” he adds. Due to this, regeneration of trees reduced drastically. “We can’t harvest even a tenth of the amount we used to. Some fruits like jackfruit have disappeared completely,” says Uike. The decline hit the residents hard. Gunia Bai Uike of Bod says, “When we had fruits, we had plenty to eat and sell. We were never very rich, but we had no fear of starvation.” In the past 40 years when the forest produce declined steeply, the tribal residents migrated to neighbouring districts of Chhindwada and Seoni for agricultural work. “Now this work is also not easily available because farmers are turning to machines,” says Munshilal Chavan of Pipalbarra. 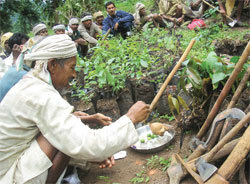 In 2001-02, 100 villages in Betul and Harda came together to restore the forest’s biodiversity through plantation. This endeavour answers many needs, says Anurag Modi of NGO Shramik Adivasi Sanghatan (SAS). “Malnutrition and poverty rates are high in the two districts, and availability of fruits can counter them,” explains Modi. The work being done by the tribals is valuable for forest conservation, considering the state’s past plantation efforts have failed, he adds. This is borne out in a report by the Comptroller and Auditor General (CAG), which says that between 1997 and 2007 the state did not carry out compensatory afforestation in 70 per cent of the projects, while in the rest 30 per cent plantations did not survive. The tribals have invested heavily in terms of both labour and money in this endeavour. An analysis of planting (2,500 saplings) shows a high cost. “The nursery work required 200 people to work for 15 days to prepare seedlings and five people to water and protect them daily for four months,” says Munnalal Uike. The plantation work will require about 150 people for a week. This comes to 4,650 man days. At Madhya Pradesh’s minimum wage of Rs 183 per day, this amounts to Rs 8,50,950. In addition, 56 kg of plastic bags were purchased at Rs 100 per kg, for which the five villages paid in cash, taking the total cost of the endeavour to Rs 8,56,550. “Once the saplings are planted, we will have to take care of the plants for at least four years,” says Munnalal Uike. Around 20 such plantation drives are being undertaken this year in different patches across the 100 villages. Activists trash these arguments. Anil Garg, a land rights and forest researcher in Betul, says, “The fact that fruit trees are disappearing reflects badly on the department’s teak-centric management style.” The department does not even keep a record of felling of non-timber species, he claims. “Bamboo has virtually disappeared from the forest because of inept management. Destruction of plants is wrong on legal, social and human grounds,” he adds. Commenting on the encroachment issue, Modi says staying near the plantation has been necessitated by the department’s own activities. “The plantations have been destroyed so often that people prefer to guard them day and night.” In Pipalbarra, land was neglected by the department and overrun by lantana before people chose to plant saplings of fruit trees, says Modi. The implementation of Forest Rights Act—which could provide much relief to the tribals—has been abysmal in the two districts. The officials have rejected large number of applications for individual land claims. “It is impossible to talk about community forest rights in this atmosphere because people can’t believe they can have rights to forests, when even titles to their agricultural land are being denied,” says Rajendra Gadhwal, an SAS activist.